ARTICLE: I’ve been a big fan of star gazing since I was very young. Living in places like Santa Barbara in the 1960s, and the “just built” Davis, California college town circa 1970, it was an amazing sight to sit outside at night and see the world spin against the sky of light. Anybody who still lives outside a major city, away from “light pollution,” can still marvel in this view that awed the ancients and gave rise to many of humanity’s myths, legends, and even elements of language still in popular use thousands of years later. When we moved into the city, my mom continued to get Astronomy magazine for most of my childhood, filled with amazing images of the galaxies and constellations. I got my first telescope as a tween, and sadly, it wasn’t as exciting as the NASA pictures you see in the magazines (or now on the Internet), since it wasn’t a top of the line Celestron, just a basic thin-tube model. The moon was big and bright, but anything else was a lumpy blob or threads in the wind. About a month into owning my new Apple iPad 3G+WiFi model, I discovered a number of “apps” for stargazing (looking at the stars in the universe, not the latest celebrity fashion statement), and one of which just blew my mind, as it were. Seeing that Apple included one of these in their latest TV commercial, I thought I’d do a round-up of what apps are available, and what makes a couple of them so freakin’ amazing. In fact, my favorite, Vito Technology’s Star Walk, is one of the most dramatic examples of the future of augmented reality – which, for the layman, means adding to, or enhancing what you see in the real world. Heads-up displays in cars and aircraft are only an itsy bitsy example of this concept. Holding Star Walk on an iPad – with the use of GPS location technology, and gyroscope sensor data – is truly remarkable. So, let me just jump to my favorite, the aforementioned Star Walk. This 89MB, $4.99 app ($2.99 for iPhone) from Vito Technology (also: http://vitotechnology.com/star-walk.html) won an Apple Design Award for 2010. What it does: okay, here’s where it gets wild – take the iPad outside at night, hold it up in landscape mode (long way, side to side), and move it around to see the jaw-dropping “Star Spotter Function,” as they call it. The iPad screen becomes a “window” that shows the sky you’re actually looking at, and curves with the shape of the earth as you move the iPad; and when you point the iPad at a section of the sky with a particular constellation (group of stars), information about the constellation appears. How cool is this? It’s like having a transparent sheet of glass that you point at the universe, and information about what you’re looking at is provided while enhancing your view. Try this in cloudy weather, where you can’t see the whole sky and it’s wicked cool. Move the iPad side to side, up and down, and the view changes to match where you’re pointing. 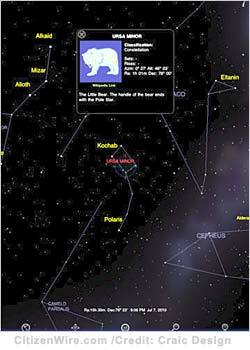 You can see just the basic info, such as lines connecting constellations (e.g., Ursa Major, etc. ), or you can “drill down” (or “up”) for background information, scientific information, and much more. Portrait mode (long way, top-to-bottom) works also, but the sensor can flip/rotate the screen image if you start to go too far overhead. If you ever wanted something that just made you suddenly realize you’re living in the future, this is one of those things. I can throw out adjectives here like amazing, stunning, or even “glorious,” and they would all be 100% true. This is simply a “must have” for anybody who loves astronomy, and this is one of those apps that can help you justify buying an iPad if you needed a reason beyond the hype and hoopla of the Mac faithful and gadget geeks. It’s also a compelling point to ensure you buy a version of any new Apple device (iPhone, iPad, iPod touch) that includes the Digital Compass and GPS capability. There is a 3-D Earth View for selecting your location if you don’t have the GPS capability. What’s more, the app offers a time machine mode to show what your sky view would look like at different points in time, moon phases, deep sky objects (Messier), and even meteor showers. The obligatory links to Wikipedia are also provided. It also has multi-tasking support for the updated iOS versions supporting things like listening to music while you stargaze. Vito also makes a similar product for solar system gazing, called Solar Walk ($2.99), offering orbital views of the sun and planets, and information on each world in our system. For Windows Mobile users, Vito also makes a bit different product called AstroNavigator ($19.95). 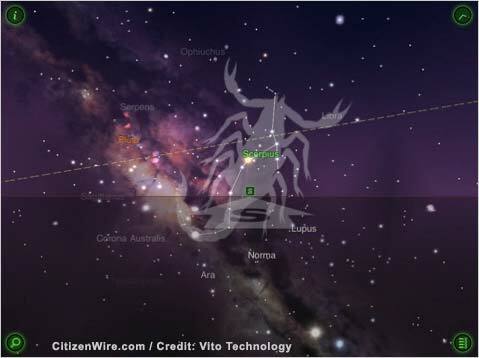 It provides similar information 9,000 sky objects, but without the dramatic augmented reality features of the iPad app. Some other notable apps worth trying out, include: “Pocket Universe: Virtual Sky Astronomy” ($2.99, 9MB; iPhone/iPad) from Craic Design. This is a similar product to Star Walk, but is a bit more informational than immersive (1/10th the file size of Star Walk). 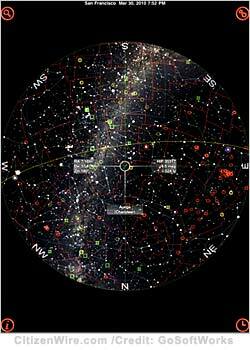 I found the design to be good for quick information about what I was looking at in the sky (see photo, this page). 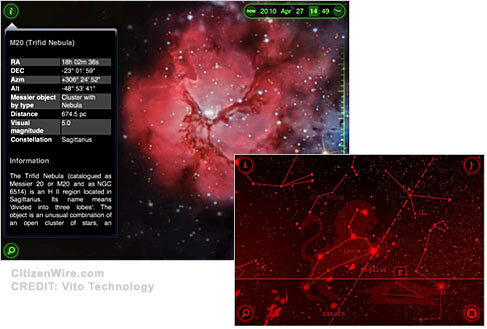 If you’re familiar with using an astrolabe in school, then you might like GoSoftWorks’ “GoSkyWatch Planetarium – the astronomy star guide” ($5.99 iPhone/iPad; 15MB). The “polar” view of the sky around the Earth is particularly nice (see photo, this page). It contains over 200 images of planets and deep sky objects. Neat features include time lapse animation by day, time, and sidereal day; finder to locate planet, star, DSOs. One neat feature, is constellation links to Ian Ridpath’s StarTales (Ridpath has numerous great books on the sky, stars, planets, and the universe). This app also takes advantage of accelerometer and compass navigation capabilities of Apple devices. I actually got this for my iPod Touch after seeing it in Wired magazine last year. The new version is even better. There is also a free version as of this writing which lets you try this great app out. There are now quite a few apps to choose from – this article covers just a few, obviously – and it’s worth exploring them all since your particular mindset may prefer one type of interface or “style” of information presentation. What makes the Vito app, in particular so amazing, is that it is a true forerunner of the kinds of information technology we will all have access to over the next couple of decades as we get more integrated personal data devices and better “cloud” data sources. Imagine going to an historical site like the Aztec ruins, and being able to hold up your iPad (or other tablet) and point it at the ruins and see a virtual window into what the locale looked like, generated from 3-D/CGI data. As you move your “window” around you, the view changes to show the civilization that used to be there. Perhaps it might happen with 3-D glasses with little built-in screens that opaque when activated, but that seems further off than what could be done “now” with something like this iPad app. I have a wonderful book I bought back in 1991, called “Then and Now,” by Stefania Perring and Dominic Perring (Macmillan Publishing), that did something similar. The full color photo book would show a modern photograph of the Step Pyramid and then printed on clear plastic overlay, color artwork showing what it originally looked like. 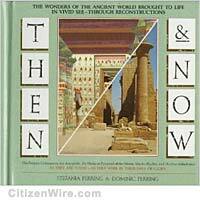 This was very cool as it showed sites like Nimrud, or the Temple of Karnak, “then and now” (hence the book’s title). Being able to do something similar in real-time, on-site would be simply breathtaking – point your tablet at the world and travel back in time, while you’re actually there. And for those who didn’t want to travel, this would obviously be used for virtual immersive “distance based travel” to virtually visit a real world site, but also see the historical version in 360-degree surround view. If you love stargazing, or want to teach your kids more about the universe, or just want to show off what your Apple device can do, then get to the App Store and check out these great apps. Personally, I would not use software like this on a regular Mac or Windows PC, as it’s not “right there” as with the iPad versions. Simply put, welcome to the future people – my love of stargazing has been rekindled, and I can’t wait to see what comes next. Article is Copr. © 2010 Christopher Laird Simmons – all rights reserved. Story originally appeared on CitizenWire.com.